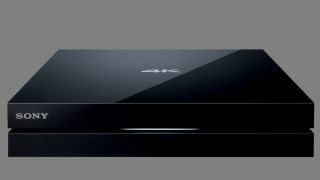 Sony has announced plans to release a 4K media streamer for all of its 2012 and 2013 Bravia 4K TVs. At a European press event held at Pinewood studios earlier today, Sony said the new FMP-X5 is intended specifically for owners of the KD-84X9005, KD-65X9005A and KD-55X9005A (4K TVs which launched too early to include an HEVC decoder) whose only previous option for 4K movie streaming was to secretly imagine watching them. The new box will launch across Europe in August and will cost £350 - not exactly cheap for a box whose only announced feature is to stream House of Cards Season 2 in Ultra HD - that being the only currently available 4K title on Netflix, which is in itself the only HEVC 4K streaming service currently online. Breaking Bad 4K is coming soon, of course, along with - presumably - a lot of others. Sony says it is at least considering adding support for Google's VP9 codec which would enable the streaming of YouTube's growing library of Ultra HD videos, but would not be drawn on whether this would be in place in time for the product's launch or if it would indeed happen at all. "It's under consideration" was the non-commital response to our probing questions. In addition to the fairly steep cost, potential suitors of the X5 should be aware that they'll certainly need a robust internet connection if the X5 is to be anything more useful than an ornament. Unlike the Sony FMP-X10 which launched for US movie lovers last year, there are no media storage options on board the FMP-X5, and that means no 4K movies will come bundled with the box, no 4K movies will be able to download onto the box, and of course there'll also be no buffering of 4K streams for anyone with ropey pipes. We spied a USB port on the back of the X5 which does at least suggest you'll be able to play back local 4K content if you can download it onto another device, but of course, the only 4K movies currently available to download are Doesn't Exist, LOL Good Luck 2 and I Know What You're Not Watching Next Summer. Sony's 2014 range of 4K TVs are unaffected by this news, as they're already fully compatible with HEVC - hands up who regrets being an early adopter.